The perfect storage solution for any paddle sport enthusiast The unique arm shape is perfect to hold both standup paddle boards and kayaks. Use it with a combination of one kayak and one SUP or use it with 2 kayaks or 2 SUPs. Heavy-duty freestanding rack It is made from steel and then powder coated to withstand elements if you decide to use it outdoors. (We would not recommend this rack being used in near saltwater for long periods of time.) Being made from steel this rack can support up to 175lbs which should be enough for even the largest kayaks and SUPs on the market. The tripod base is very steady and it comes with adjustable feet to level it out on any surface. The feet also have a place for an anchor to make it even more secure of you are mounting it on your dock or deck. Adjustable crossbarThis kayak and SUP rack comes standard with a crossbar that connects the two freestanding towers. It can be adjusted from 4 feet to 6 feet to accommodate whatever size boats or boards you have. 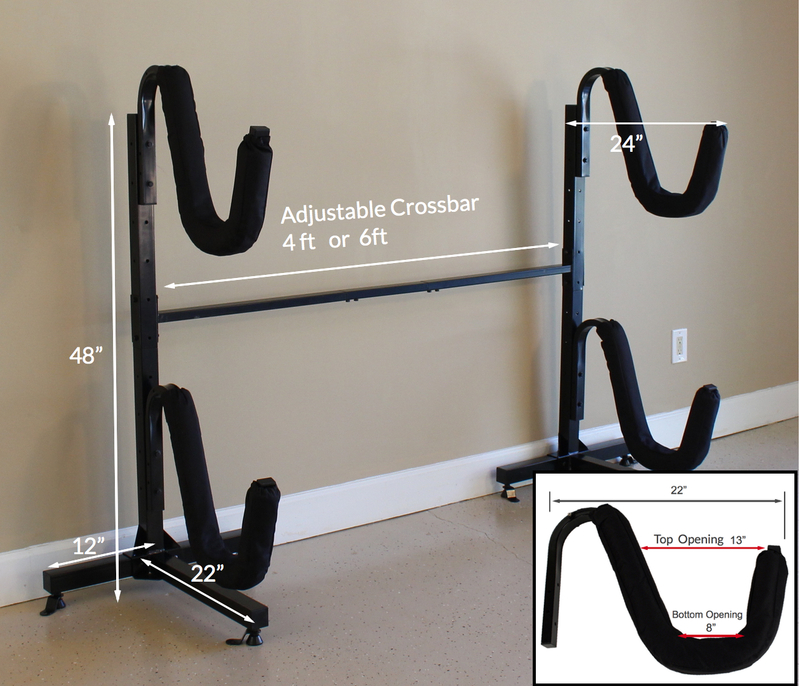 The crossbar adds extra stability to the rack system. Optional caster wheels for mobility Opt for the set of 6 caster wheels to easily roll the rack around for better organizing or loading right onto your car's racks. Each Tower is 48" in Height and the base is 24" x 22"
We needed storage for our paddle boards but did not want them down at the dock or in open weather, so having this system allows us to display our decorative YOLO boards under the covered patio and take up less room. Quick shipping. Easy assembly. A very sturdy, well built storage rack. We wanted a rack to store our kayaks indoors in our unfinished basement. This rack positions the top rack at a more reasonable height for taking the top kayak on and off. Just a FYI - we have two Wilderness System Tarpon 120 kayaks which are 12'3 and 30 inches wide. They weigh 63 pounds each. Due to the shape of them they fit perfectly with the open cockpit facing towards the back of the rack instead of facing out towards you. Hope that info is helpful for those with a fishing kayak. Easy to assemble. Quality construction. Well done. Timely shipping. Home assembly: ok I'm a complete dolt on home assembly, there's only one way everything fits, the included wrench was perfect, and EVEN I assembled it. We use it for 2 kayaks, one 10.5' and one 14.5'. Works perfect, very pleased and we gladly recommend it. Is this stable on grass? Pur kayak/SUP freestanding rack would be best for use on solid surfaces rather than a lawn. It has adjustable feet that help level it on many surfaces, but on grass you could run into problems with how stable it might be, and that may vary by type of lawn, landscape, etc. You could maybe put something down on the grass - a board or pavers - to set it on, if you really don't have another surface, though it might be okay on some lawn areas; there are safety straps available to help further secure your boards, and it does have a crossbar that can help stabilize it further. Another note on outdoor use of this rack - it is not recommended for use outdoors in saltwater areas, though it is a good outdoor option for use in freshwater areas. I have two 16 foot kayaks. Will this system hold them? Our two kayak stand adjusts to a maximum length of 6 feet. So for very long kayaks, such as your 16 foot boats, you would have 6 feet of your boat supported between the two rack arms, then 5 feet would be hanging over one each end of the rack. That may be enough support for your boats, but it is getting to be quite a bit of length on either side - and while it should be stable, it may be a question-mark. Some other factors you want to to consider, for whether this stand may work for your kayaks, is how wide and how thick/deep your boats are, as well as their weight. The stand can support a total of 175 pounds, so your boats need to weigh no more than that combined. There is some play in width - but generally the bottom level will only fit a kayak that is approximately 29-30" wide at its beam. For depth, where the kayaks sit in the stand tapers from 13" to 8" - so your boats would need to be able to fit in those slots for it to work - meaning, they would need to be less than 13" thick at about 5 feet in on either end of a boat 16 feet long. So we can't guarantee they will work for both of your long kayaks, but if they fit the other parameters (weight, width, thickness), they may work. Is the rack stable in the wind? Stable from tipping over as well as from having a kayak or paddle board blow off? Our two Kayak/SUP rack is a stable rack system. It should be set up on level ground though, and there are anchors included that can be used if you choose to mount it onto floor, ground or dock (instead of using it as a freestanding system). When used as a freestanding system, the crossbar included helps stabilize the system overall; and overall your kayaks/SUPs should stay in the rack, but you could use safety straps if you are storing where it does get extreme wind, to help keep them in place.